In order to gain success, home improvement companies must continuously gain new projects. But as all those in the business already know, acquiring the right customers can be and is quite challenging. The fact of the matter is that in this day and age, the road to success lays in making your business as visible as you possibly can in that place where you know they are already looking and that is, Online. Search engine optimization is the best way to get this done. It is so important you make every effort to improve your site for search engines such as Google to best understand your pages and in their search results feature them. Continue to see just how hiring an SEO consultant can be of assistance to your home improvement company and just what are the best ways to get this accomplished well. For home improvement companies, just why does SEO matter so much? Just take a moment and give some thought to what you did the last time that you were seeking a service or a product for yourself. You probably went to Google and entered a phrase such as “car insurance Edmonton,” or “hair salon Edmonton,” just like virtually everyone else does these days. Your next effort would have been to scan the results, then go to the one that sounded best by clicking on it so that you could get more information. You then most likely repeated this with one or two other sites and then got in touch with what you believed to be the best candidate and made an appointment to see them, or perhaps got a quote from them. Just know that your customers are going to use this same process and SEO is going to be the way that they are going to see your home improvement phrases and related words. Keep in mind that even though you have an understanding of SEO, you may not be entirely up on how to handle it on your own so that it works best. The good news is that we are giving you some beneficial information below and also, for a free evaluation, you can contact us online today! Take a look at just three of the significant benefits for your business when you use web page optimization for search engines. is a great way to get your site ranked well in search engines. You can and will significantly increase your brand awareness, and customers who may never have ever heard of you before will become aware of who you are. You are going to become a part of the research process of your potential customers with the help of SEO. This way you can explain what sets you apart from your competitors and all about the services that you offer. , you are going to keep making more. And entirely unlike those strategies of traditional advertising where only for a specific time your ad runs on third-party platforms, the efforts you put into SEO on your site will go on indefinitely. Your site is going to continue bringing in new leads for many years to come, once you have established your rankings. And the other great news is that price increases for ad space is something you will never need to be concerned about! Home Improvement SEO And Just What Does It Involve? To rank well in search engines, there are many different factors involved. This is why SEO takes several different tactics to get best the job done. Take a look now at four that are so important. It is so important that you have an understanding of the phrases and words that potential customers will put to use in seeking out home improvement services before optimizing your site to rank for any particular keywords. Identifying the best keywords for your business is what keyword research involves. Also, determining just how difficult they will be to rank for is also so important. The rest of your strategy is going to lay on this critical foundation. After determining just which keywords are the ones you want to target, each of your pages will need to be optimized for a specific one. This is accomplished by using on the page that keyword in title tags, meta descriptions, headers and body copy. Search engines are helped by this in understanding your site’s pages topics and for relevant searches, rank it in the results. SEO also involves the creation and the publishing of new pages of original content, in addition to optimizing your site’s existing pages. You can write pages, as a home improvement business, which will answer common questions addressing frequently heard customer concerns, provide ideas for remodeling projects and answer common home improvement questions as well. You also have an opportunity to rank for additional keywords beyond your services, when these pages are optimized for search engines. Doing so gives your readers the confidence that you are indeed a reliable resource to call on. Reliable information is what search engines are seeking to provide, and the best way the credibility of the site may be determined is an examination of the links leading to it. The higher you are going to rank in the search results will be defined by the more links that you have from reputable sites. Such an essential part of SEO, but also a challenging one, is building links. You are going to have to reach out to bloggers, journalists, editors and other owners of sites and show them that readers will find interesting the content that you have. With content creation, this all goes hand in hand, because the more reputable sites will link to yours, the more interesting content that you publish! If you have invested heavily in your online business, it is obvious that you are looking for any idea that can help boost your ranking. Times have changed in internet marketing, and new strategies in marketing are emerging. The search engine optimization (SEO) landscape keeps changing and even the old SEO techniques are being remodelled to keep up with the times. One of the most effective SEO tools so far has been link building, and while the debate continues about the best application of backlinks, there is no denying this is a must-have in your SEO campaign. If you are finding it hard to reach your target audience, it is time to rethink your link building approach in line with ongoing algorithm updates. This is the only way to remain relevant in this viciously competitive marketplace. Why should you bother about SEO in your marketing campaign? For a start, you must consider that there are more than 3.7 billion internet users according to the International Telecommunications Union (ITU). A recent Pew Research Study says 8 in 10 Americans are online with 15% of Americans shopping online on a weekly basis. 51% of people in the U.S prefer to shop online, and when these numbers are considered in combination, it becomes obvious that the internet market has limitless opportunities. However, there is a catch; a good looking website alone does not suffice when it comes to online marketing. In spite of how fantastic your website looks, you will never achieve your marketing goals if you are not investing in techniques to boost your SEO efforts. With search remaining the #1 driver of traffic to content websites, it goes without saying that SEO should be at the core of your overall marketing strategy. Your online business can grow tremendously, but this will only happen if you are ready to adapt your marketing strategy to suit emerging demands. In line with the ongoing Google algorithm updates including Google Penguin among others, you need to tweak your backlink practices. There is no denying the link between backlinks and high ranking on search engine result pages (SERPs). In fact, a study by Moz shows the direct relationship between quality backlinks and high ranking on Google results. The study seeks to answer the question whether any site can rank highly without backlinks and the answer is simple; for you to rank highly on SERPs, you need quality backlinks. 90% of all the top results had at least one external link pointing to the website. Authority: The authority of both the linking page and the linking domain are important metrics if you want to determine the quality of a link. If the authority of a linking page and domain is high, this is beneficial to your SEO efforts. Follow vs. Nofollow: The rel=”nofollow” attribute is one of the oldest features in link building and it elicits different reactions. A no-follow link is not supposed to boost ranking but if you are focusing on getting quality traffic, don’t let a no-follow attribute discourage you. Location of a backlink: Link placement is a crucial factor in determining the value of a link. The clickable aspect of a link matters, which means a link that is placed in an area where it can easily be clicked will have more weight. Anchor text: Anchor texts are important in link building, but then they should not be over optimized. It is very easy to over optimize for an anchor text because it is one of the easiest ranking factors to manipulate. The best idea is to be content with the anchor text the one linking to you decides to use rather than risk a penalty for over optimizing. Link relevancy: To discourage webmasters from misusing link building, Google uses link relevancy to determine the quality of a backlink. If a page has very many outbound links, the value of a single link is low. Your target pages when looking for links should be those with less number of outbound links. Research: You should take time to research your backlink targets to avoid reaching out to bad prospects. Take time to look at the backlinks pointing to your competition using tools such as Ahrefs. This helps you know how your competitors are building links and also finding high-value link targets. Outreach process: This is an art more than a science and will depend on your goals. It can either be structured or unstructured, but the bottom-line is to meet your unique needs. These are the broad steps you will undertake in the link building process. To get the best out of your backlinking campaign, you can use among other techniques link magnets or ego baits, interviews, link reclamation/broken link building, checking what is trending and write targeted content for press releases, guest blogging, using images, content repurposing and syndication, directories, blog, forum, and community participation among others. There are different automation tools that can help you in link building including those for competitor and link research (Ahrefs, Majestic and OSE from Moz), for content research (Buzzsumo and Ahrefs Content Explorer) for web monitoring (Google Alerts and Mention) and for outreach (Buzzstream, Ninja Outreach, Yesware and Mailshake). In conclusion, link building remains one of the most important cogs in any successful SEO campaign. It is a powerful technique to boost flow of traffic, increase conversion rates, build brand recognition and much more. With these simple techniques, you can now build links without risking penalties from Google. Search engine optimization techniques are the most effective way to drive traffic to your website. In spite of this, many companies continue to concentrate on the use of on-site SEO, completely disregarding the importance of link building. Google is basically saying that natural links occur as a direct result of your quality content. However, there are some other ways that will help you generate them. If you’ve done any amount of research, you may have noticed this is a recurring theme in marketing. The truth is that knowing your target audience is what lays the foundation for your strategy to make your business a success. If you don’t know what your customers need, want, are interested in, how can you create content that will appeal to them? As mentioned above, natural links are a direct result of other sites finding your content valuable enough to share with their own audience. If you establish yourself as a trustworthy source of information that provides its readers with interesting content, the links will follow. However, creating good content alone is not enough to help you generate natural links. The internet is full of sites filled with great content. So, remember that promoting your brand and your website will be necessary to make sure that people are even aware that your content exists. There are three ways you can get your content out there. Guest blogging consists of publishing content on other websites that can link back to your own site. If you choose to go this route, you should be careful about which sites you select to guest post in. Not only should these sites be relevant to your target demographic, but they should also be reputable and have an engaged audience. You wouldn’t like to go to all the effort of creating a guest post only to have it end up collecting dust on someone else’s website. Thanks to Google’s ever-changing policies, article marketing has gone through some changes since it was first introduced. Nowadays, publishing business articles on several directories are not as great at generating natural links as it used to be. However, much like guest blogging, if you do your research, choose the right website, and create a good quality business article, this too can be a useful tool. Be sure to follow the site’s guidelines and tack-on an enticing bio to drive traffic to your website. Most video networks let you add links to the video description, which is another great way to generate natural links to your site. Remember that these videos, like every other kind of content your company creates, should appeal to your target demographic. You probably already know that social media is a great way to promote your brand. By using different social media platforms, your company can engage with its customers, establish a relationship with them and, of course, generate natural links. Aside from the usual methods of including links in your business’ profile page or bio section, there’s something else you can do to help your link building efforts in social media. Word-of-mouth is an old strategy, but a really good one. These days, social media influencer marketing is the new, modernized version of the traditional form, where ordinary people reach celebrity status and have a lot of influence over their many fans’ purchases. When it comes to choosing an influencer to help you carry out your marketing campaign, make sure that he or she is relevant to your business. Their content should align with your brand’s; their public should match your target audience, etc. And if you feel like you’re too small of a fish to apply to turn to influencers, micro-influencers might work for you. Generating natural links is somewhat of a time-consuming effort, but it will be worth it in the end when you see your website ranked on the coveted first page of a search result. Remember to focus on producing good quality content and promoting it in the right manner. The key to generating the kind of links that will help your ranking is that they shouldn’t be obviously promotional, they have to be relevant to the context of your content, and they must provide value to your customers. The internet marketing industry has changed a lot over the past few years. Years back when most digital marketers focused their efforts on questionable SEO tactics, buying email lists and ads, the focus these days is on content marketing – creating great content that attracts visitors and leads to your business. By publishing content that is aligned with your end user’s interests, you naturally attract visitors to your online properties and convert them over time. But that was until a few years back. The challenge today is to get your content seen. By 2015, the number of blog posts published every single day had crossed 2 million. Getting your content seen is getting difficult day by day, and it’s imperative that you have a solid content promotion plan along with your content creation plan. In fact, gurus like Derek Halpern and Brian Dean swear by the 80-20 rule of content marketing, which says that only 20% of your time should be spent in creating content, and the rest 80% on promoting that content. Today, I’m going to show 4 strategies we use to build links, drive shares and build buzz on social media networks using a variety of email outreach tactics. We all blog regularly. And we all have the habit of linking out to related blog posts and authority websites on the topic. We all regularly mention and cite strategies used by gurus (notice how I talked about Derek Halpern, Brian Dean and the 80-20 rule of content marketing above). Most of us don’t reach out to them and tell them that we’ve cited their work. And this is a very underutilized strategy to get influencers to share your content, and get eyeballs (and hopefully links) from well known bloggers in your space. Here’s how you can do this very easily. Suppose I wanted to reach out to both Derek and Brian because I mentioned them in my post. I’ll quickly browse over to their blogs (Backlinko.com and Socialtriggers.com) and use the Hunter.io chrome plugin to find their contact emails. I hope life’s great in Berlin. I love your 80-20 rule of content marketing rule. It makes total sense in today’s world. I just bragged about it in my new post on email outreach. Not asking for anything, just trying to impress you lol. That’s it. A simple email. And yes- they might be receiving tons of emails like these a day, and they might not share your content. But think about it this way: you’re on their radar now. And if you’re content is truly gold, they’re going to share it. In fact, I got a long line of influencers from Joe Pulizzi to John Lee Dumas and John Jantsch to share our list of free marketing podcasts simply by shooting a quick email to all of them telling them how much I loved their podcast, how I’d compiled a list of the best marketing podcasts on the planet, and included their podcast in my list. In the long run, this also helps you build a rapport with some great marketers out there! You can always reach out to people who have expressed an interest in similar content by sharing it, and then reaching out to them about your content. This is a tried and tested strategy, and I’ll show you a step by step process to tap into it. First, find all similar content. If I take the list of marketing podcasts above as an example, I would google for the ‘best marketing podcasts’, and compile a list of all similar blogposts. Then, I head over to Buzzsumo, and check the Twitter Sharers for each of these links. I can also go ahead and export the list of sharers. Then I organize all this into one Google Sheet and sort by the number of followers and average retweets (both available from Buzzsumo) to find who the influencers are. I hope life’s great in Florida! 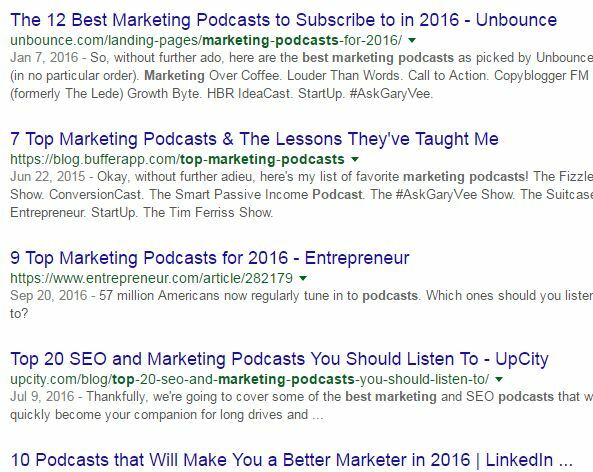 I noticed that you’d shared Stephanie Saretsky’s brilliant piece on the Unbounce blog on the best marketing podcasts to subscribe in 2016. I loved that piece. In fact, there are a great many podcasts out there for brilliant marketing advice. And I put together the most in-depth list on the planet with 121 podcasts. Would you mind if I send you a link when it goes live? And the advantage of this strategy is that it’s really scalable. With the help of a few outreach tools like Mail Merge or Mailshake, you can send your influencer outreach emails to hundreds in one go. Roundups are underestimated. Most SEO companies think they’re just about links. What they don’t realize is that roundups can send a whole lot of traffic your way if you manage to get into the top ones. Almost everyone from Moz to Problogger does roundups. You just have to personalize your outreach emails and make your content piece look interesting to bloggers. Collect the link to the roundup posts you find along with the author’s name and contact email (use Hunter or Voila Norbert). Love all your posts on the TVS blog, and especially the roundups. It’s always great to be able to see a curated list of the best blog posts in our niche. I thought I’d reach out because I just published a mammoth list of the 121 best marketing podcasts, and I’d really appreciate it if you could check it out. And again, roundup link building is quite scalable simply because there are a lot of bloggers a that regularly do roundups. Press links are some of the best links you can get. Not just because they’re authoritative, but also because they can also send you some solid traffic. But a spoiler alert: this strategy works best for data backed infographics, researches and studies. In fact, Brain Dean considers brand mentions on news websites as a Google Ranking Factor. I’m going to show you how you can connect with journalists and writers using a bunch of tools and some nifty outreach. First, prepare a list of your target news websites. If you simply search for your target keyword and click the news section in Google, you can see a list of the big publications in your industry.Make a list of these publications. Now use the site:domain.com “keyword” operator to find the journalists and writers who write about your target topic on these publications. I loved your article on [topic] on [publication name] and thought you’d be looking for similar interesting stories. Always mention the topic of your study/research/article in the subject line. Journalists and press writers receive hundreds of pitches a day- just give them what they’re looking for. List the most interesting insights from the study/research. With some logic and quick research, there are tons of ways you can leverage email outreach for content promotion and traffic building. Got any nifty ideas on how you can scale this up, or how you built links or shares with these strategies?